What I find interesting are the ’sidetracks’ from ‘permanent research staff’, what this might imply, and the lack of paths from the non-research and non-academic sectors back the other way. Does our tendency to import new research staff from overseas (not shown; see page 44 of Igniting Potential) reflect a flow-through effect reflecting poor retention of staff within the country and why? *I have suggested the establishment of a ’re-entry’ fellowship to FRST (or was it MoRST or one of the other organisations?! ), but got no response. Please note the data have been corrected by MoRST in a comment received a short time ago (5:50pm, 13 May 2010). I have copied the entire comment immediately below. The broad nature of the graph remains similar after the correction, but the figures involved are revised. Please note that an error has been made in the description of this diagram. 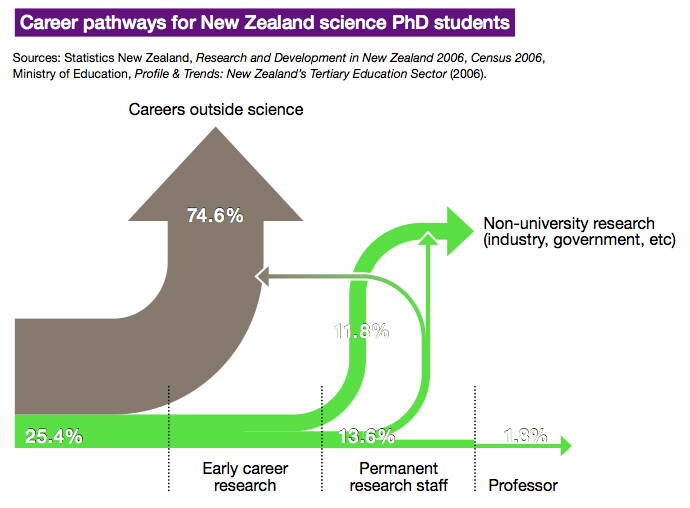 It is entitled ‘Career pathways for New Zealand science PhD students’, but what the diagram shows is all 14,148 PhDs employed in New Zealand* — not just those with science PhDs. This diagram also excludes the 2,619 PhDs not in the labour force, about 15.6% of the total PhDs in New Zealand. Also note that this diagram does not show all movements within the workforce, such as career breaks or people with PhDs returning to research after pursuing another career. Below is a breakdown of the employment of science-related** PhDs. An amended diagram showing these is available from the Ministry of Research, Science and Technology. However, the picture of New Zealand science careers shown in this diagram is similar to the diagram in Igniting Potential. ** Includes natural and physical sciences; information technology; engineering and related technologies; architecture and building; agriculture, environmental and related studies; health. Excludes areas such as society and culture; education. A permanent copy of the corrected graphic is available at the MoRST website. Are many people surprised that such a high % of PhD’s end up outside of science? (Of course I wonder what the definition is of “outside science”). When I was doing my PhD I assumed that most PhDs ended up in industry or academia. Even now I find it extraordinary that 3/4 of PhD’s end up outside of science. I wonder if that is by choice or lack of opportunity? I’m not so surprised, but then I’ve seen stats with similar trends for other countries. It is interesting, though, that this happens after a Ph.D., as opposed to after an undergraduate degree. NaÃ¯vely you would think a Ph.D. would lead to research in one form or other. FWIW, it’s one of the reasons I advocated in my â€œstudent adviceâ€ article for students to try working for a year either before or after their undergraduate degree to get a â€œpreviewâ€ of sorts. Grant, I’d be interested in reading any references to similar trends overseas, if you have them at hand. I find it incredible that 3/4 of PhD’s end up in careers out side of science. What do they end up doing? I could almost see the current government arguing (erroneously in my opinion) that if the majority of PhD graduates are not “making use” of their degree, then NZ should have less PhD students. I assume that some will go into education (although I assume Uni lecturers are still counted in the 25%) and some into government (hopefully championing science for us) but would that account for the full 75%? Granted that the skills developed during a PhD can be applied to a wide range of jobs, but with the current government being very outcome orientated I do wonder if such figures might cause problems for science in the future? Thats a pretty depressing graphic. although I’m not particularly surprised given the number of PhD graduates I know who can’t find jobs in science, and the number of postdocs I know who haven’t been able to find permanent positions (myself included!). The other thing that I would be very much interested in determining is how many of the 75% are there by choice and how many are there because of lack of opportunity in finding a research related job in NZ? Most of us probably know of people with PhD’s and postdocs who can’t find research based jobs. One factor that discourages students from continuing study in science is that science often seems the only career option. However, an education in science equips people for many different careers. There is real demand for these people in professions that do not involve the direct application of scientific knowledge but do require an appreciation of what science can do. For example, nearly 75 percent of science PhDs go into jobs outside science, as shown in the figures below. It is vital to promote the variety of opportunities that flow from a science education and for scientists and those with a background in science to take a higher profile in discussing the benefits of their work and education. From memory the article linked in â€œStudy of where academic careers leadâ€ has something to say on this. I recall it was beautifully written, too, complete with quote from Casablanca. Grant, Iâ€™d be interested in reading any references to similar trends overseas, if you have them at hand. I wanted to include it but don’t have them to hand and I was short on time to track it down again (still am, and hence the vague reference to it!). how many of the 75% are there by choice and how many are there because of lack of opportunity in finding a research related job in NZ? I agree, the deeper story is in the wherefores. In a similar way I’m curious about the elements behind the permanent university research staff shifts to outside the universities and outside research. The worrying thing for me is the funding of people who are seen as adequate PhD candidates who later leave science. This is effectively at the expense of people who are passionate about science who would make great scientists however due to the extreme competitiveness of PhD programs have grades that may be seen as inadequate. We are in effect wasting 75% of the science money we spend training all these people. The universities simply want the best students they can get for the 3-4 year period they have them, in effect doing science in the long run a disservice. Sure a PhD in Chemical Engineering looks great on your CV, employers in many disciplines would love to have you and you may be paid more, however in leaving science you have effectively taken money from shrinking research funds that could have used to train researchers who are in it for the long haul. Judging exactly who these people are is a tricky business, all I know is that the current competitiveness of entry into PhD programs may result in a bad outcome for science in the long-term. I was wondering how they actually arrived at that figure? Because there are lots of international PhD students in NZ who go back overseas once their finished, and lots of NZ PhDs who end up working in science overseas – those people wouldn’t be counted in a census, so are they included in those figures? Maybe its only 75% of those who stay in NZ, which would be a much smaller number of people. I do also agree that (a) we train too many PhD students for the research jobs available in NZ – I think this is partly due to the fact that it is much cheaper for PIs to hire PhD students to work on their projects than to hire postdocs, as in universities at least they have to pay overheads on postdoc salaries so most people simply can’t afford to write postdocs into grant applications. And (b) I agree that there are many worthwhile jobs that you can do that a PhD equips you well for, but aren’t actually research jobs. This isn’t necessarily a bad thing, but I would think most people doing a PhD do it because they want to do research. Hiliary, this is a good point but I know a few people who decided halfway through their PhD that research wasn’t really for them so they struggled to finish it and then moved into another career e.g. patent law. It’s quite interesting how many people probably go into a PhD not realising what it entails. Prior to PhD we are often used to doing science which works – because all undergraduate labs tend to be well worn and reliable experiments. Sometimes it is not until a PhD that one experiences the true challenges of science and some people just can’t deal with it. Also university undergraduate work is largely academic while PhD can require extremely good practical skills. I think Evan’s point about how PhD students are selected relates to this, but then sometimes doing a PhD is a baptism by fire – you don’t realise what you are in for until you are in the middle of it, and it is hard to identify those who will succeed. Science is a fairly insular field, and it requires the right kind of mindset to be a successful scientist. A career in scientific research is a fairly one-way street from early career research upwards. For those who don’t wish to become PIs or professors, once you’ve reached postdoctoral status there’s not really a lot of chance for career progression. I think many PhD candidates nowadays realise early on that they can use their PhD for careers outside science that will give them more career opportunities. I agree that NZ funds too many PhD positions for the number of research jobs available. Though I wonder if we restricted the number of scholarships available, how would we know which students intend to stay in science? Basing selection on academic performance clearly won’t work. Working in research prior to starting a PhD, (as an RA or similar) demonstrates a desire to stay in the science field. I think far too many students leap into a PhD without fully understanding what it entails or what they want out of a career, just because its the ‘next thing to do’. Maybe these students are more likely to move into other fields when they are complete? Lukag, I agree with you in principle but if the number of PhD students were reduced, many university staff would suddenly find over half their lab work force gone, and their outputs would drop – not good for NZ science. It’s an interesting problem. I have found some lecturers are very helpful in advising PhD students on their career options, whereas there are a small minority whose prime aim is to squeeze as much research out of PhD students with little interest in their futures. This sort of behaviour should be discouraged by universities but as such researchers can be the most productive this isn’t always the case. Also we probably should not underestimate the value of have PhD graduates employed in non-research roles in education and government, if they are able to champion science in these areas. Still 75% does seem a ridiculously high number not to be doing research. Perhaps it would be useful to have some sort of thorough career advice sessions available for those considering a PhD. I know of PhD graduates with post doc experience who are now school teachers, work for family businesses, working in university administration, retrained as medical doctors etc, and in most cases they would still be doing research if there were only more opportunities for it in NZ. Please note that an error has been made in the description of this diagram. It is entitled â€˜Career pathways for New Zealand science PhD studentsâ€™, but what the diagram shows is all 14,148 PhDs employed in New Zealand* â€“ not just those with science PhDs. This diagram also excludes the 2,619 PhDs not in the labour force, about 15.6% of the total PhDs in New Zealand. Thank you for the clarification & update. I will add a pointer to this in the article itself shortly. I think we will have to get Peter Griffin to add this to his ‘Visably Shaken’ blog. That was clear as mud! Isn’t the fact that most university positions are evaluated on publications track record so any break immediately disadvantages someone wanting to re-enter the academic track (given the relative oversupply of qualified candidates)? There are exceptions such as practitioner based schools (like law) which encourage industry experience but it seems that this “barrier” may be structural.